Parents looking for something for their children to do this summer may want to consider an all-day camp at OCCC, said Camp Coach Rone Tempest. “We have [Sport Camp and College for Kids Camp] in the morning and, in the afternoon, we have Fit Kids camp … ,” he said. OCCC’s Summer Sport Camps and College for Kids run from 8 a.m. to noon. Fit Kids Camps are from 1 to 5 p.m. Lunch is served in between the two camps, Tempest said. “It’s one of the few pro-grams in Oklahoma City where you can … drop your child off at around 7 a.m. and not have to pick them up until 6 p.m., and know that they’re well taken care of and eating a nice lunch,” he said. Tempest said Fit Kids Camps involve a different type of physical activity than the morning Sports Camps. He said Fit Kids Camps focus on physical activity as well as on health and safety. “…What we really try to stress is nutrition as well as injury prevention. “By stretching and doing plyometrics, we’re trying to educate these kids on how to properly exercise — and most importantly, to play games that accomplish both,” Tempest said. “The fact of the matter is that injury is the worst thing for any athlete. Tempest said children can sign up for one week at a time. “It’s such a great program that a lot of kids are here all summer long,” he said. “We have a theme every week. We try to mix it up a little bit. “For instance, this week is Amazing Race, so we do a lot of obstacle [courses],” he said. “ … Most kids are confined to a single sport. And this is a great opportunity to expose a lot of kids at a young age to multiple sports. Tempest said that’s something he doesn’t see much of. There are four afternoon Fit Kids Camps available in July. Tag! You’re It! runs the week of July 7. Wet N Wild runs the week of July 14. Fitness Fun runs the week of July 21, and Active Lifestyle Adventures runs the week of July 28. An all-day Fit Kids Camp called Summer Blast Extravaganza starts Aug. 4. For more information about Summer Sports Camps, call 405-682-7860, or visit www.occc.edu/rf. 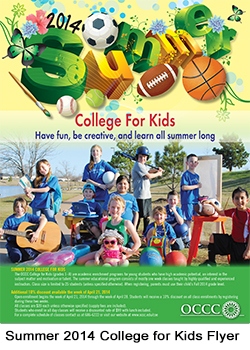 For more information about College for Kids classes, call 405-682-1611, ext. 7205, or visit www.occc.edu/coe/college4kids.